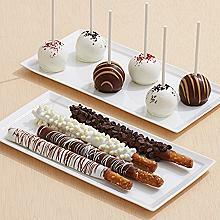 Make all your loved ones’ Christmases a sweet sensation with 4 Dipped Pretzels and 6 Assorted Cake Pops this holiday season. An abundance of goodies that are certain to tantalize even the taste buds of even the most finicky gift recipients this holiday season, this magnificent assortment of individually dipped pretzels and assorted cake pops are definitely a must when it comes to unique Christmas gifts this holiday season. Each order contains a variety of scrumptious pretzel rods, each dipped in fantastic flavors like milk chocolate and white chocolate, and decorated with festive swizzles and tasty chocolate chips, and 6 assorted cake pops including red velvet, cookies and cream, and peanut butter- each topped with irresistible red velvet crumbles, crushed Oreo® cookies, and peanut butter flavored swizzles. With superfast processing times, these decadent treats make excellent last minute Christmas gifts for everyone on your list. Love cake pops! Would love to try these!